The Amoeba High Grade Magazines are constructed out of a strong polymer material. This is what the "High Grade" denotes on the box, a more durable external polymer, and a slightly stronger inner spring. The external front portion of the magazine is textured for grip especially when using gloves. Towards the base plate is a built in folding magazine pull offering the user a easy to grab tab to pull when reloading. 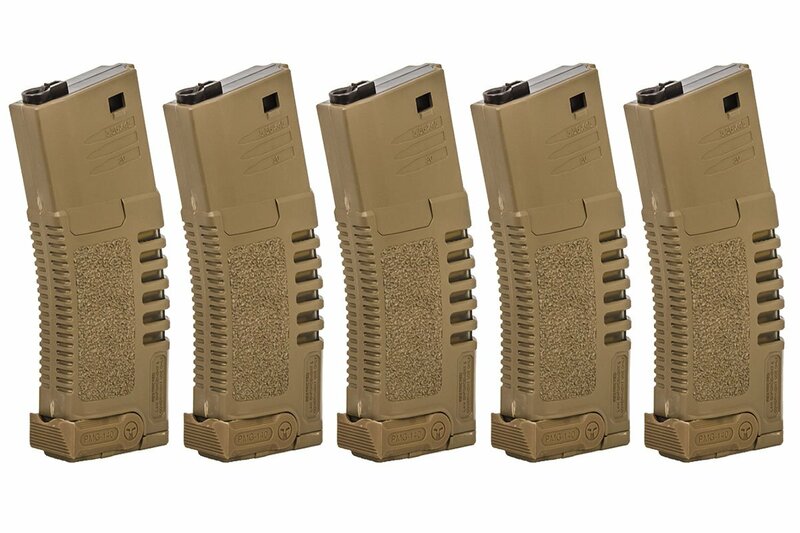 The magazine holds up to 140 rounds which is a slightly higher capacity than standard M4 magazines, resulting in a higher total round count in a given set of magazines. Have a couple of these in your load out to make sure you have the fire power to take on opponents. This magazine is designed to fit most M4 Replicas in the airsoft on the market, but cannot be guaranteed by Airsoft GI. This magazine comes in Flat Dark Earth and comes in a set of 5.